Oh my goodness, I adore this comic!! So much cuteness and hilarity! Wallace and his best friend, Spud, meet the new girl at school, Amelia, and are very impressed with her courage and baseball-throwing style. Each page has its own funny little punchline as we follow Wallace’s strange interactions with friends and family at school, at home, on the ocean, on the field, through the summer and winter and all the in-between times.Wallace’s fisherman father, his creative mother, and weird baby brother make a delightful home setting for the antics and whimsical conversations of a little boy curious about the world and determined to dream big. One of the best things about this comic is Wallace’s close relationship with his parents. When Wallace comes to his dad with a crazy idea, his father doesn’t criticize or say how ridiculously impossible it is to trade in their car for an ostrich to ride. His father enters into the fantasy with his son, and they have fun deciding how they will saddle their ostrich and cook the ostrich eggs. I love seeing kids and parents really talking and enjoying one another’s company! What a great family! 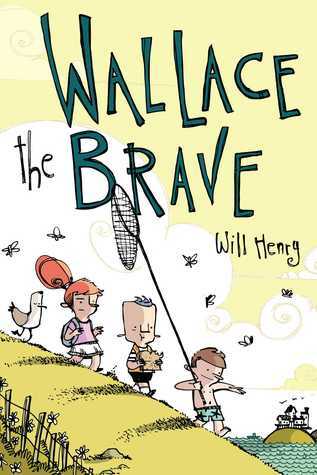 Best Friend Spud is an anxious neighbor boy who follows in Wallace’s bold wake with trepidation, and Amelia is a mischievous tag-a-long who prefers to lead. This mismatched trio burst into new situations with the wild recklessness of youth, throwing their shoes out the door, and skirting around the imaginary monsters lurking in drains and under beds. I adore everything about this comic! The artwork is playful and cute. The jokes are entertaining and hilarious. The characters are splendid in every particular. The style reminds me strongly of Peanuts and Calvin and Hobbes put together! I wish I could give this 10 stars! Disclaimer: I received an ecopy of this book from the publisher via NetGalley in exchange for a free and honest review. All the opinions stated here are my own true thoughts and are not influenced by anyone.